The spring flowering season may be over but there are still many species orchids to provide flowers for you in November and December, although not all are suitable for the shade house. As before, those species marked with an asterisk probably require winter warmth and are grown by me in a glasshouse maintained at a minimum temperature of 12°C. When grown under cool conditions (in my masdevallia house) Ada aurantiaca produces its eye-catching orange flowers in October and November. It prefers conditions suitable for members of the odontoglossum alliance, and does well for me when grown in a mix of pine bark and chopped Sphagnum moss. Barkeria spectabilis* is an attractive Mexican species, related to the reed-stem epidendrums, that has a long dormant period during winter, when it loses all its leaves. Best grown on a mount, it should not be watered until its new growths begin to appear in spring. The inflorescences, followed soon after by the large pink flowers, emerge from the centre of the new growths after only a few weeks. If you don’t already have one, Coelogyne mooreana should be at the top of your shopping list. Its racemes of sparkling white flowers emerge from the centre of the new growths as they appear in spring. Mature plants usually flower again in autumn, giving excellent value for money. 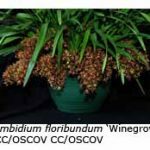 It happily grows as a companion plant to cymbidiums. 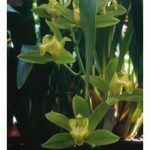 Cymbidium lowianum is one of the last cymbidium species to flower each year. 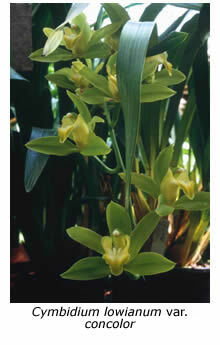 Its green flowers are characterised by a large triangular-shaped red spot on the labellum. Resist the temptation to divide it and it will eventually produce a spectacular specimen too large to fit in the average car! 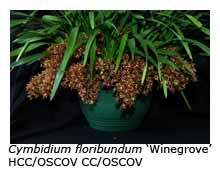 The miniature Cymbidium floribundum (syn. C. pumilum) also flowers in October and November. 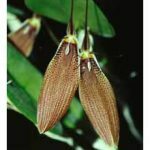 Most Australian dendrobium species flower in spring but Dendrobium moorei begins to flower in December and continues to display its small, white bell-shaped flowers throughout summer. A native of Lord Howe Island (off the NSW coast), it is not all that common in cultivation but well worthwhile growing if you can track down a piece. Mature plants continue to flower for several months. Dendrobium nobile and its hybrids will produce a spectacular floral display in December if (and only if) you are able to provide your plants with full sunlight during winter and early spring. If your neighbour’s house or trees block the sunlight from your shade-house at any time during that period, don’t even think about growing soft-cane dendrobiums! Some orchid enthusiasts find the South African ‘Pride of Table Mountain’, Disa uniflora, impossible to grow and I must admit that I lose a number of plants each year. However, those that survive multiply at such a rate that the number of offsets has exceeded the losses for the last twenty years. The spectacular display of colour in December is one of the highlights of my year. Always keep the plants moist and move them to a cool spot on hot days when they are in bud or flower. I re-pot all my disas in fresh Sphagnum moss every March. Encyclia baculus* (syn. Prosthechea baculus) is one of the larger plants in my glasshouse but I tolerate the space it occupies for its reliable and long-lasting floral display each November. The fragrant ‘cockle-shell’ flowers are produced back to back in pairs. 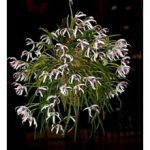 The miniature Mexican species Leptotes bicolor* needs a heated glasshouse but doesn’t take much space and I hold it in high regard for its curious white flowers with a contrasting purplish pink lip. 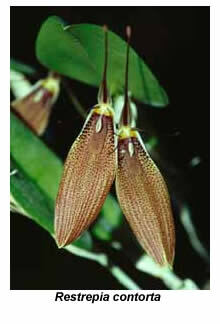 Everyone should have Masdevallia veitchiana, a native of Peru, in his or her collection. It seems to be more tolerant of temperature extremes than many other masdevallia species, while its large, bright orange flowers make it arguably the most desirable in the genus. I re­pot M. veitchiana and my other large masdevallia species and hybrids in a mix of pine bark and chopped moss every year or two. A mix of chopped moss and polystyrene moss, renewed annually, is used for the smaller masdevallias. For many years I grew Restrepia ephippium, R. contorta and R. trichoglossa in my heated glasshouse but have since found that they do almost as well in my unheated masdevallia house. Known by some as cockroach orchids, they produce flowers that are better described as curious rather than beautiful. They produce a colourful display if allowed to grow into specimen-sized plants. 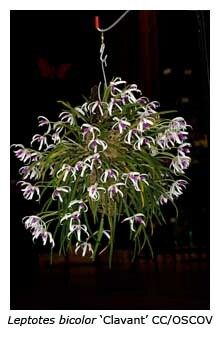 The flowering season of Sarcochilus hartmannii and its hybrids is at its peak in November. No orchid collection should be without this Australian native species and a range of its hybrids. Grow the plants near the ground, where humidity is highest, and they will reward you with a spectacular, long-lasting floral display. Watch out for snails and caterpillars, which love their glistening white or coloured flowers. Pholidota chinensis seems to grow and flower better for me in a shade-house than in my heated glasshouse. A miniature species from China, it produces arching spikes of dainty, buff-coloured flowers that last through all December.